New Jersey online gambling has been growing steadily since it soft launched in November of 2013. By the end of January, 2014, the New Jersey Division of Gaming Enforcement had reported a twenty-seven percent increase in the total number of accounts created. This is also reflected in the corresponding increase in revenue, which jumped from $7.4M in December to $9.5M in January. What makes New Jersey online gambling so attractive to the gambling community? One of the main reasons is because players report that they feel much safer wagering on sites that are regulated. No longer do they need to be concerned about whether or not they will be able to collect their winnings. Another attractive quality of New Jersey online gambling is that the 15% tax the state levies on online gaming revenue will go a long way to help fund state programs and services. This levy is considerably higher than the 8% tax garnered from land-based casinos. Furthermore, this new industry could well lead to the creation of numerous high-tech jobs within the state. Currently, online gambling is only licensed within the states of New Jersey, Nevada, and Delaware. However, only poker is available in Nevada whereas New Jersey and Delaware offer a full suite of casino games. And yet, there has already been a bill introduced by New Jersey Senator, Raymond Lesniak, which seeks to open New Jersey online gambling sites to gamblers from other states. The goal of this bill is to cash in on a $33 billion dollar online gambling market worldwide. Some New Jersey residents particularly enjoy the fact that they can now access sites like www.wsop.com because this reputable network has a high volume of games and players. At any given time of the day or night there are several tournaments running. And, because it’s possible to play numerous hands simultaneously, players can compete for more jackpots than they could had they been playing at a more traditional brick and mortar establishment. Many of these players are former members of PokerStars, arguably one of the biggest online poker sites prior to being shut down by the United States government in April, 2011. The Unlawful Internet Gambling Enforcement Act of 2006 strictly prohibits the transfer of money for any online casino game prohibited by state or federal law. Consequently, players are flocking to the licensed casinos. Unlicensed and unregulated offshore sites are gradually being squeezed out of the marketplace. In addition to offering players the assurance that winnings will be paid, there is now a place for players to turn in the event of a dispute with the website operators. Current law dictates that New Jersey online gambling is only available to people who reside within the state. As a result, not only have online casino operators begun relocating to Atlantic City, but so too have those in related service industries. This includes people involved in payment processing and geolocation services. Thus, not only is the state benefitting from the gaming revenues, but also from the creation of new jobs to support this growing industry. According to American Casino Guide, New York has 20 casinos, Pennsylvania 12, and Connecticut has three. Nevada now has 181 with 1,543 established nationwide. The land-based casinos aren’t worried. New Jersey online gambling not only helps to generate new players that will also frequent their establishments, but they also help to promote Atlantic City as a major gambling destination. New Jersey online gambling sites allow novice players to learn to play for free and offer generous incentives for depositing players. 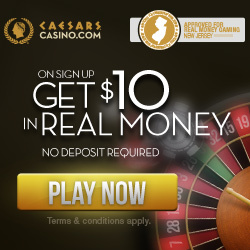 If you live in New Jersey, Caesars Casino is currently offering a $10 no deposit bonus as well as a $300 welcome bonus on a first deposit. Take advantage of this great offer and see for yourself what is making this industry such a booming business.